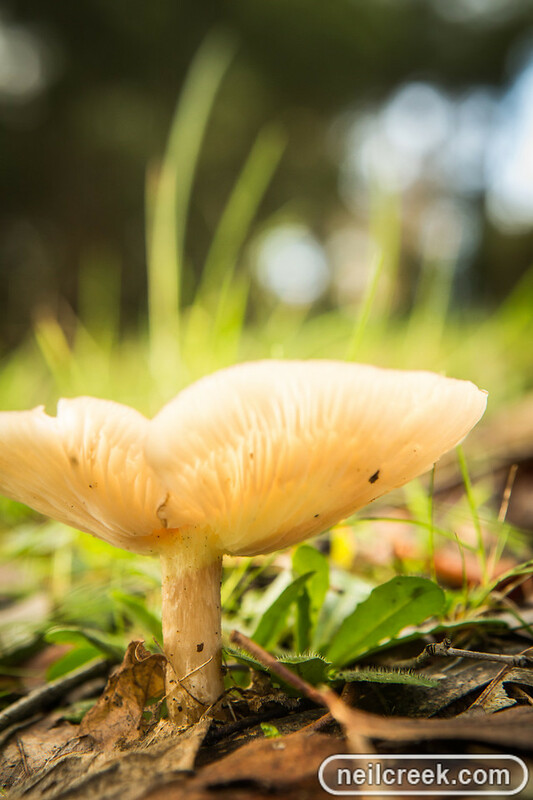 This time of year fungi are popping out of the ground all around our place in the hills! This one was about 10cm across and one of several like it in the area. This was a slightly tricky shot to get for a couple of reasons: 1: I wanted a blurry background, but at f2.8 too little of the mushroom itself was in focus, so I changed to f7.1. This was a great compromise, since being so close to the subject still kept the background blurry. 2: I wanted a very low angle but the ground was wet and I wanted to stay dry. Getting focus with autofocus is tricky when you can't point the AF point accurately where you want it. To solve this I went to manual focus and set the focus ring to the shortest focal distance. I then turned on live view and zoomed in one step. This way I could crouch next to the camera, rest it on the ground and move it in and out till the stalk appeared in focus on the screen on the back.